I have only been writing my blog for a few months now and have loved the little community I have entered and the friends I have made. One of the first friends I made was Karen who writes the beautiful blog Lavender and Lovage. She writes about seasonal flavours and local produce from her kitchens in France and England. Karen has a gorgeous writing style and includes snippets of history and poetry in her posts. She has also mastered the art of taking stunning photos of her food. Do pop along and make a new friend. A gentle meander down the lane to the local Farm Shop........that early morning pearly light that shimmers over barren fields; the sharpness of first breath as you leave the warm cocoon of home. The crackle and snap of feet kicking through crisply fallen leaves and then the glorious vision of sizzling leaves of gold, orange, bronze and flame red; beech and bracken, elm and elder, all bedecked in gaudy colours and now showing more than they should, branches blatantly on show with sparse leaves to cover their dignity.......smoke suspended in the air above toy cottages and tidy terrace houses. Family dogs barking by wooden garden gates and cats skulking behind ragged hedgerows whilst seaside gulls wheel above, squawking and shrieking with delight as they are lured by the richer pickings of "inland" dining. One batch of the following cake mix makes 8 to 10 muffin size cakes. Place the dried fruit, peel, clementine juice, butter, sugar and water in a saucepan and simmer gently over a low heat with the lid on for 20 minutes. Allow to cool and then add the beaten egg, ground almonds, mixed spice and sieved flour. Mix well and then pour into prepared tins. Shake the tins gently to level the mixture and bake for 45 to 50 minutes; test with a skewer after 50 minutes, which should come out clean if the cake is cooked. Cool the cakes in the tins for 10 to 15 minutes before removing from the tins and allow to cool completely on a wire rack. Make some holes in the cake with a knitting needle or a skewer and feed with whisky for several weeks. I was lucky enough to receive a wonderful Mich Turner cake decorating kit recently from Baking Mad, which is one of my very favourite websites for fabulous inspirational baking recipes. In my kit there was a pack of ready to roll Madagascan Vanilla White Icing, ready to roll finest quality Marzipan, Gold Lustre, Pearl Lustre and Bronze Lustre ~ the makings of a creative decorating set for cakes and bakes. Mich Turner is famous for setting up The Little Venice Cake Company in London where she has created cakesfor celebrities and international royalty including Her Majesty The Queen, Madonna, Pierce Brosnan, Sharon and Ozzy Osbourne, Cheryl Cole, Gordon Ramsay and David Beckham. She has recently launched this cake decorating range with Silver Spoon, and it is this fabulous new range that I received fromBaking Mad to review. If you are looking for the snowflake cutters they can be bought online here. The ready to roll marzipan was a dream to work with and smelt strongly of almonds, which we like in our household. I brushed the cakes with warm sieved apricot jam before cutting out the marzipan rounds with a Tala measure! It was the perfect size for the cakes. I eased the rolled marzipan over the cakes and gently moulded it over the cakes before using a handle from a rolling pin to ease the marzipan around the sides of the cakes. I let the marzipan dry for about 3 hours before decorating the cakes with the vanilla icing. The ready to roll icing was just as easy to handle as the marzipan and has a subtle but obvious vanilla flavour. It rolled out easily, was smooth and silky, and was very easy to manipulate. Now comes the part that I love ~ the creative bit, decorating the cakes; I cut out rounds of the rolled icing to just slightly larger than the cakes and eased it over the top of the marzipan.......I painted some of the pearl lustre over the cakes and then sprinkled some edible glitter over the top......now to the snow flakes. I have a "plunger" snow flake cutter in three sizes that I used, you need to roll the icing out fairly thickly so they keep their shape when they are applied to the cakes. The pearl lustre is a perfect "glue" for the snow flake shapes, and saved me from having to use an egg white, which is what I normally use to "glue" on sugar craft decorations. I also painted some more pearl lustre over the snow flakes and shook a bit more edible glitter over the tops for good measure. I stamped out several sizes of snow flakes as I like random decorations, and I was really pleased how these cakes turned out. The lustres add a professional finish to the cakes and gives a wonderful sheen. I was very impressed with the quality of these products and the marzipan is high in almonds whilst the icing has a natural vanilla flavour. With thanks to Baking Mad for sending me this decorating kit to review; I was very impressed with the quality and the flavours of the marzipan and icing were almost home-made ~ the liquid lustres make a stunning and professional finish to all sugar craft decorating and I certainly added a magical snowy sheen to my Christmas cakes as you can see from the photos. Thank you Karen! 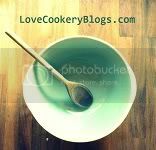 Don't forget to pop along to Karen's blog Lavender and Lovage for daily food inspiration. THANKS so much for the glowing write up Kate, and I am so pleased that my wee whisky cakes and then the snow flake cakes captured your culinary imagination! Thrilled be a guest host on your blog today ~ thanks for your kind words! Nice whiskey cakes looking very delicious.I like to make it on my own and have a delight full party.Thanks a lot. These are stunning Kate. I am not a fan of big xmas cake making but I might have a go at these lovely little parcels. so detailed and creative. simply beautiful!! These are amazing. Love the snowflake detail.